Any thoughts/concerns for current leaked specs for Ryzen 3000 being well supported for overclocking, memory speeds/compatibilities on this board when it drops? I don't know alot about the VRM besides remembering that the K7 was a bit lacking compared to a few of the other early offerings phase wise, My current plan is to hopefully upgrade to whatever 12 core is released, I'll upgrade motherboard if needed but Ideally if I don't have to it would be nice. This board has good quality VRMs, just not a very good heatsink. 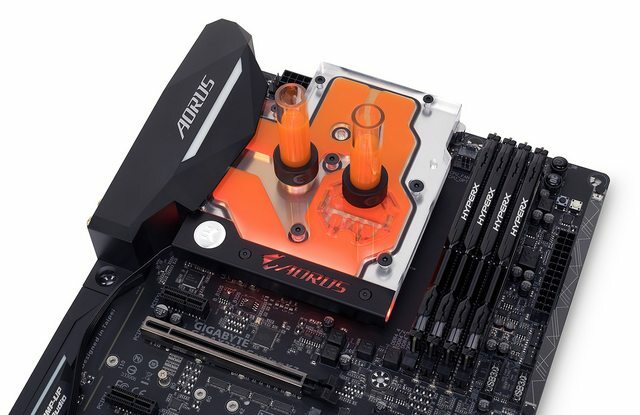 You can get a monoblock for it, EK sells them and they are currently half price. I'm not worried about bios support for the new chips, gigabyte has been pretty good with updating so far. Ya I know they have monoblocks for the X370 price wise I'd certainly be interested but unless there is a good reason to switch to a monoblock (which Would require rebending 100%) I probably wouldn't do it. As well that I don't know the compatibility going forward for monoblock on X470 or X570 boards if I stick to gigabyte if I have to change motherboards. I can get my VRM's to 100C+ with my R7 1700 at 4Ghz 1.38v because I'm using the EK supremacy evo AM4 block and there's not much airflow near them.. If I got a 2700X and overclocked it this much the board would likely run into thermal shutdown. I'm holding off on fitting the monoblock until I get one of the new 7nm cpus, but I have one sitting here ready. The monoblock is half price because it's basically on clearance, eventually they won't be available anymore. When will the new 7nm CPUs be released? We don't know when they will be available, AMD has a keynote at CES in ~4 days time and they might be announced then. So I noticed the F24 BIOS has been removed from their site. Ive experience high vcore, or as i see it, board sets the vcore to 1.425 on auto or normal, so if you use DVID you end up with a ton of voltage, and if the RAM is set to XMP or above optimized defaults speed, unable to wake from sleep and then fails to boot. F23 not that different, dont think i got the boot issue though, and the high vcore has been present since F21. Board behaves fine for me on F22. Been plagued with issues with F23 and had problems on earlier revisions, so I'm not that thrilled to update. I've been good on F23, F24 wouldn't restart properly for me (had the same problem with F22). I'd run F7b with my 1700 if I could find a copy of it, the file link on the gigabyte forums doesn't work anymore.